Winnipeg, MB (November 1, 2018): The Manitoba Museum will honour the Winnipeg Free Press at its annual Tribute Gala on April 4, 2019. The annual Tribute celebrates the contributions of individuals and organizations whose leadership and philanthropy have shaped our city and our province. The Winnipeg Free Press has been an integral part of the community representing the hopes, dreams, and ambitions of its readers. It is a leading source of local news, information, and debate and shares Manitoba’s voice on national and international issues. The 146-year-old newspaper will be represented at the Gala by co-owners Robert Silver and Ronald Stern. Established in 1872, the Winnipeg Free Press is the oldest newspaper in Western Canada. It is two years younger than the province of Manitoba, which joined Confederation in 1870, and two years older than the city of Winnipeg, which was incorporated in 1874. 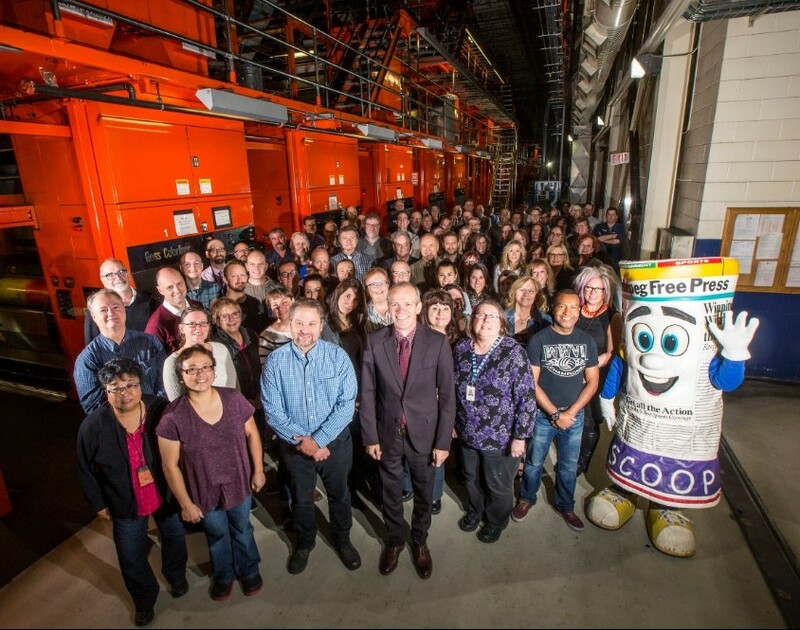 The Museum has had a lasting partnership with the Free Press – editorial coverage, advertising, and unique events such as the Treaty 1 anniversary celebration with the Treaty Commission of Manitoba, Manitoba Business Council, and the Winnipeg Aboriginal Sport Achievement Centre. The Winnipeg Free Press is the largest independent newspaper in Canada. Its majority owners are Ronald Stern and Robert Silver. Ron and Bob both have strong roots in Manitoba. Ron, who was born in Saskatchewan and now lives in Vancouver, maintains ties to Winnipeg, where he was raised. Bob is well-known and respected in the Winnipeg business community and valued as a go-to person for insight, advice, and leadership. Each year, the Winnipeg Free Press directly supports more than 100 community organizations with sponsorships and advertising grants, promoting events, causes, and accomplishments that help build the city and province. The list ranges from hospitals, universities, and museums to festivals, the arts, parties, and fun runs. Annually, the newspaper organizes direct fundraising drives to benefit the Christmas Cheer Board, providing Christmas hampers to the needy, and the Manitoba Camping Association, allowing more than 600 youths to go to summer camps. The newspaper is also diligent in its coverage of what is happening locally, publicizing the work of countless groups that contribute to the well-being and vibrancy of Winnipeg. Visionary ownership, as well as superior editorial and management staff, have provided the Free Press with the journalistic and commercial leadership required to maintain its position as the largest selling newspaper in Manitoba. The newspaper business is a precarious one these days. What newspapers bundled, the internet has unbundled. The internet allows consumers to go directly to their desired content without opening a newspaper. However Ron Stern is proud of the way the Free Press is adjusting to the challenges facing the newspaper industry. Co-owner Ronald N. Stern graduated from the School of Law at the University of British Columbia in 1972. Mr. Stern is the founder and president of Stern Partners, which is involved in the ownership and operation of numerous companies. In addition to supporting various non-profit activities through Western Glove Works, the R & J Stern Family Foundation is an active supporter of a number of cultural, educational, and health organizations in Canada. Ron serves, or has served, on a variety of corporate and community boards, including the Vancouver Airport Authority, Vancouver East Cultural Centre, Vancouver General Hospital and University of British Columbia Hospital Foundation, Vancouver Symphony Society, Canadian Council of Israel and Jewish Advocacy, Jewish Community Foundation of Greater Vancouver, and Science World British Columbia. Bob Silver is President & Co-owner of Western Glove Works Ltd., a family-owned business dating back to 1921. The company markets its well-known Silver Jeans with the motto: “Be present. Be inspired. Be authentic…Be Silver.” The company has distinguished itself as a leader in corporate responsibility by developing a program to ensure awareness of and protection for all basic human rights. Bob is Ron’s partner in Western Glove Works and various other businesses, including Warehouse One, Urban Barn, and Comark retail businesses. Bob and his businesses are generous supporters of the Manitoba Museum, Assiniboine Park Conservancy, Canadian Museum for Human Rights, and the Winnipeg Art Gallery Inuit Art Centre. He serves on the boards of Centre Port Canada, First Peoples Economic Growth Fund, the RBC Convention Centre, Canadian Apparel Federation, Winnipeg Library Foundation, is a past chair of United Way of Winnipeg and is Chancellor of the University of Winnipeg. Proceeds from Tribute support the Manitoba Museum’s Access for All community initiative, which provides complimentary Museum visits for more than 60,000 individuals living with special circumstances each year. Contributions to Tribute 2019 will provide impact and help the Museum create memorable learning experiences that build pride in Manitoba and tell the province’s essential stories, bridging language, culture, ethnicity, and age. Lloyd N. Axworthy, PC C.C. O.M. Hartley T. Richardson, C.M., O.M., LL.D. H. Sanford Riley, C.M., O.M., LL.D. The 15th annual Tribute Gala will take place in Alloway Hall on April 4, 2019. For information about reserving tables, buying tickets, sponsorship opportunities, and/or to make a donation to the Access for All community initiative, please contact Jakee Werbuk at 204-988-0629 or email jwerbuk@manitobamuseum.ca. Past Tribute Honourees – Abdo (Albert) El Tassi and Samira El Tassi (2018); Gregg & Mary Hanson (Ambassadors for Canada 150 Celebration in 2017); Sanford H. Riley (2016); The Winnipeg Foundation (2015); Doug Harvey (2014); Susan Lewis & United Way Winnipeg (2013); Kerry Hawkins (2012); Ambassador Gary Doer (2011); The Chipman Family (2010); Babs & Gail Asper (2009); Kevin & Els Kavanagh (2008); Lawrie Pollard (2007); Murray Taylor & Investors Group Inc. (2006); and George T. Richardson (2005).